I think we all understand the purpose of dramatic packaging (marketing, marketing marketing). The graphics, the wording, it all plays a key part in selling a product or service. There are even people out there whose soul job is market evaluation and making a product more saleable then the competition. They even hold focus groups that rate everything from a products name and colouring on the package to the font used and logo design. It’s important I get it, but all the hype and strategy shouldn’t deceive the consumer about the product inside. Now “Z” is a beef jerky conn oisseur and has made beef jerky his snack of choice since he was about a year and a half old. I am concerned as all moms are about what is in the products that I feed my kids, especially the ones that they want to eat all the time. I stand behind the products that Dingo Farms produces and I know there is a small amount of nitrites in Dingo Farms Beef Jerky….there has to be, the nitrites give the product some shelf life and more importantly prevent the formation of botulism. It does add somewhat to the flavouring as well because it is basically salt. Now as I read the back of the package there was one item on the ingredients list that immediately caught my attention “cultured celery powder” Now here is the thing; celery as a fresh vegetable has one of the highest naturally occurring nitrate numbers out there as are spinach, beets, radishes and cabbages. Surprised?, I was when I started reading. On an average 10 % of our nitrite exposure is from cured meats and 90% naturally occurring from vegetables. Now don’t panic, you don’t have to live on nuts, fruit and beer, remember moderation and awareness!. So what happens to those naturally occurring nitrates when you process cultured celery to a powder? Because I am not a chemist I came home and researched, in fact I invite you to do the same. 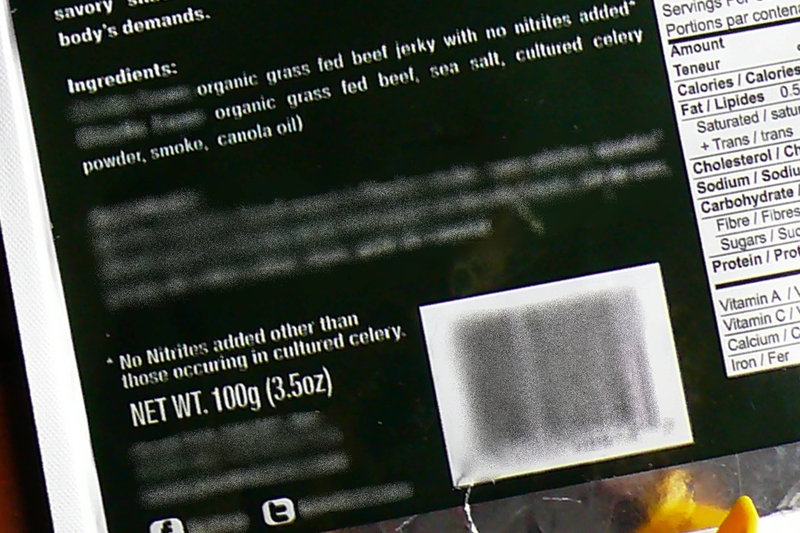 What I found in my opinion is a clear lack of transparency and honesty by any Marketing team or producer who markets their product under the guise of natural, nitrate free, nitrite free and no preservatives when in fact the cultured celery powder is a nitrate and acts as a preservative (and is equally harmful). It does what sodium nitrites have done for years under the pretence that it is a healthier alternative when in fact it isn’t. For the most part the nitrates in cultured celery powered tend to be far more concentrated then the amount used in our beef jerky. And if you continue reading most sources say nitrites are not the health risk they are made out to be if they like everything out there are consumed in moderation. Bananas are a healthy snack and a great source of many vitamins and nutrients the body can benefit from but a diet rich in bananas would be a diet high in potassium and too much potassium can lead to heart damage and cardiac arrest. Get what I am saying? The beef jerky in the store was marketing itself as a premium product worth a premium price. The “nitrite free beef jerky” was almost $3.00 more for a portion that was considerably smaller then the beef jerky sold at Dingo Farms even though they were the same by weight. It was bloated with oil and gummy rather then that well cured (dryer) texture I prefer. Not to mention the over the top packaging some market genius thought of (does not scream sustainable to me). I admit the packaging of the Dingo Farms beef jerky isn’t pretty, but we are working on that, but I can promise when we do pretty it up, it won’t be excessive. The products at Dingo Farms along with the packaging are genuine and well thought through. We prefer the product to speak for itself and our ingredients are honest and transparent. What does our Beef Jerky package say? Naturally grown beef and minimal nitrites. Now if you truly want to know what is in your beef jerky, come grab a round roast and then pop over to our Facebook and look in our recipe folder for our homemade beef jerky recipe. You’ll see it still has the salt, but at least you can choose. This entry was posted on February 13, 2013 by Dingo Farms. It was filed under Healthy Living, In The Press and was tagged with Beef, Cultured Celery, Grass Fed, Jerky, Natural, Nitrate-Free, post workout, protein, recovery.